It is no accident that revelers at a party tend to congregate in either the kitchen or at the table spread. The kitchen is where the refrigerator is (holding all the beer) and the spread, wherever it may be set up, houses all the food. Clearly, these are the two best locations at any party. As the festivities reach into the night, inevitably, the beer is removed from the fridge, and the hors d’oeuvres are happily consumed. Usually. If you find that your guests tend to flock into the kitchen, yet stay away from the food, you may need to reconsider your approach. Perhaps it’s not what your serving, but rather how you’re serving it. 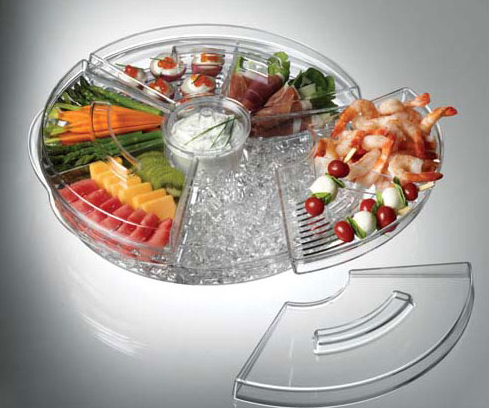 The Prodyne Appetizers on Ice with Lids serving tray keeps food fresh and chilled even as your guests warm up. The appetizers rest above a bed of crushed or cubed ice, and feature three double compartment upper food trays so as to maximize variety. There’s even a dip tray included at the center of the serving platter. To assure your guests do gather ‘round and keep the kitchen at least somewhat clear, the tray revolves, making it the perfect spinning accompaniment you want to have at your party. Whoa, Get Ready To Grill!